The town of Rosendale, N.Y., has recently embraced the switch from chlorine to UV for wastewater treatment. In Rosendale, N.Y., millions of dollars’ worth of improvements to the town’s water and sewer systems have been underway, phase by phase, since New York State started making grant funding available to municipalities hard-hit by Hurricane Irene and Tropical Storm Lee in 2011. According to Hudson Valley One, one of those projects was “hardening” the town’s wastewater treatment plant (WWTP), which had “failed during the storm events because it was overwhelmed without sufficient capacity to accommodate the demand from storm water inundation and Creek flooding,” according to the NY Rising Community Reconstruction Plan issued by the Governor’s Office of Storm Recovery in March 2014. Rosendale’s initial infusion of NY Rising money for the WWTP was a $500,000 grant for a Stormwater Management Study as the first step in “scoping and implementation of protection measures,” according to Hudson Valley One. The town used the services of engineering consultants Barton & Loguidice to conduct the study and design upgrades to the plant. According to Hudson Valley One, an additional grant of $620,000 was awarded to Rosendale under the Clean Water Infrastructure Act of 2017, constituting a 25% match intended to leverage other funds toward the purchase and installation of equipment as part of the $2,480,000 wastewater project. The balance of the cost is to be financed via interest-free loans provided under New York State’s quasi-governmental funding agency, the Environmental Facilities Corporation. According to Hudson Valley One, Barton & Loguidice recently completed the initial Stormwater Management Study and associated State Environmental Quality Review process for the upgrade. 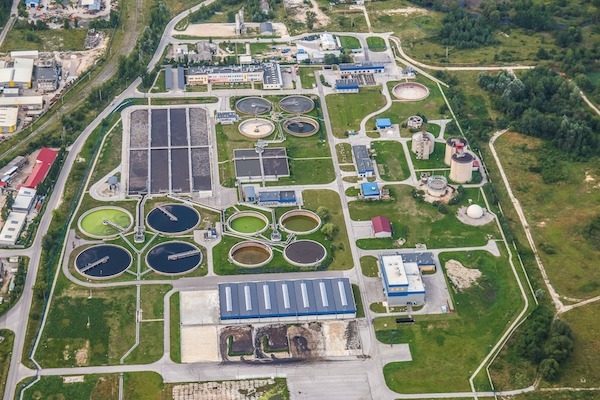 While these were in process, another state agency, the Department of Environmental Conservation, changed the rules with regard to levels of residual chlorine that a WWTP is permitted to discharge into a water body. According to Hudson Valley One, the daily maximum is now .05 milligrams of chlorine per liter of water, compared to two milligrams per liter previously. “A lot of municipalities are switching over to UV now,” Ballard said. According to Hudson Valley One, he shared a diagram of a tank with a bank of UV lamps suspended in the middle, through which the wastewater would be channeled. The Town Board responded with enthusiasm to Ballard’s recommendations, despite the increase in costs, according to Hudson Valley One.